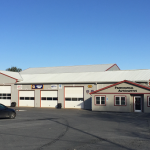 Professional Automotive Service in Myerstown PA is a full service auto repair facility. 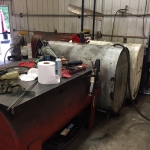 Professional is a busy shop that uses a waste oil furnace for heat. To collect and hold enough oil to last through the heating season they used 4 small tanks and transferred the oil with a portable pump. Looking to consolidate the tanks, they contacted Haldeman for information on a 1,000 gallon tank. 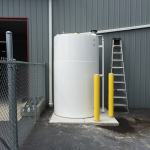 After a site survey and review of the options, Professional settled on a 1,500 gallon main storage tank and an ELIMINATOR overflow prevention / automatic transfer system. Used oil is now pumped directly from the drains to the main storage tank which is located in the back parking lot. Oil for the furnace is automatically transferred from the main tank to a holding tank inside the building prior to feeding the furnace. Once the oil leaves a vehicle and enters the drain it is never seen or handled again. Combining 4 tanks into one gave Professional back almost an entire bay in space savings. The double wall tank equipped with emergency vents, gauges and overflow protection is now safe and complies with all applicable regulations. 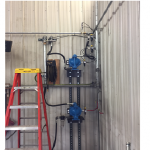 The new system freed up space, removed clutter, eliminated potential spills and automated a very messy and dirty process.